So, you are interested in contributing content to the MSACL Learning Center. It's easy to do. Before we start, please note that you will need to sign and submit a license for MSACL to post your content. The intent of this non-exclusive license agreement is not to take ownership of your content, but to acquire permission from you to post it on the MSACL website. You retain full ownership. If you ever want your video removed, you just need to let us know and it will be removed within 30 days (and probably much sooner). There is a lot out there, but for Open Source, what seems to be the top candidate is Open Broadcast Software. Once you have it installed and launched, you should see something like the screen below. This will be the palette of your upcoming creative activity. 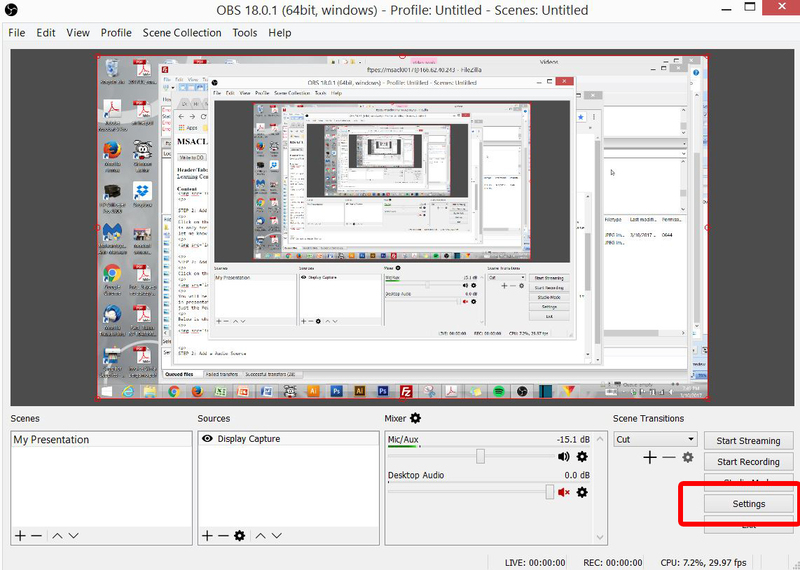 Click on the '+' icon in the lower left corner of the Scene box. Provide a title for your presentation. Nothing much is needed. From what I can tell, the title does not carry over to the file in any significant way. Click on the '+' icon in the lower left corner of the Source box. You will be provided with a list. My suggestion is to select Display since you will most likely be presenting a PPT presentation, which, when you launch it in presentation mode, will take up the entire display. If you select Window Capture (Powerpoint), it will not show your presentation when you launch it, just the PowerPoint window. A dialog box will pop up. Select Create New. It is not necessary to name it anything other than the default, Display Capture. Below is what your screen should look like after the Display capture is activated. Click on the '+' icon in the lower left corner of the Source box. Then select Audio Input Source. If you want to do this properly, and if you want your video to be posted, the sound quality it critical. You will need a headset to achieve this. It is not possible using your computer's microphone. The headset used in testing the OBS software was a Plantronics Audio 478 USB Stereo Headset. It is highly recommended that you obtain a headset: (1) with a USB jack, and (2) which does not require external power outside that of the USB connection. Click on the gear icon for Mic/Aux. This will bring up a window where you will select your microphone to be used as the source for the recording. Click on the gear icon for Mixer. In the Mic/Aux row, click the box for Downmix to Mono. NOTE: Make sure that your audio level slider is set at least in the middle (this is the 25% setting). Putting it 3/4 of the way up is likely optimal for most speech. Click on the Setting Buttons to bring up the Settings preferences. Select Output in the left Topic column. Leave Output Mode on Simple. Recording Path is the location where the the video files will be placed. Recording Quality should be set to High Quality, Medium File Size. Recording Format should be set to MOV. You can set it on MP4, but recordings saved to MP4 will be unrecoverable in the case of a computer or software failure. Select Audio in the left Topic column. Sample Rate should be set at 44.1 khz. Channels should be set to Mono. Select Video in the left Topic column. Resolution settings should be at 1920x1080. Downscale Filter should be bicubic. FPS (Frames Per Second) should be at 20. This will accommodate any animation or motion-based video in your presentation, but will minimize file size. Select Hotkeys in the left Topic column. 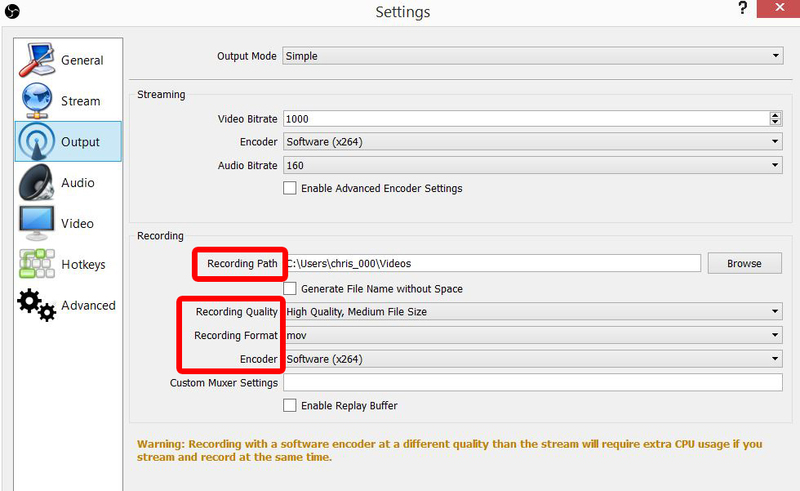 If you want to be able to Toggle the start and stop of the recording, you can set this here. "B" has been used as an example, but almost any key(s) can be used. This is useful if you want to start recording after your presentation has already been brought up onto the main display, thereby eliminating the need to clean up the start of the recording. You may still be interested in editing portions or the content of your video, but using the hotkey start/stop creates the potential that you might not need to edit at all. Select Advanced in the left Topic column. Color Format should be set at RGB. To start recording, you just need to press the Start Recording button (or use your Hotkeys). After starting recording (or before, if you are using Hotkeys), go to Powerpoint and launch your presentation. Make sure your headset is on and do a quick test run to make sure the audio settings are well-adjusted. The final file size should be about 35 to 60 KB per second (or more if you are heavy on video). Files for 10 minute presentation should be about 20 to 40 MB. Review your video and check to see if it needs any edits. If it does, see the editing tab(s) for guidance in the post-production phase (e.g., trim, delete, splice) of your video content.